Though Jio is a tree of African origin, but it grows all over the world. In India, it is found everywhere in moister parts. 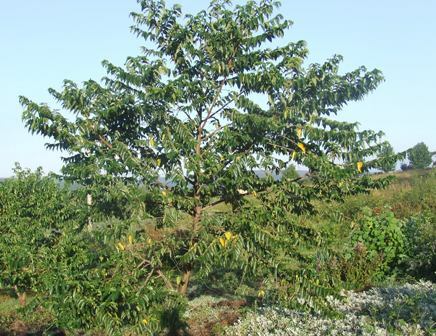 A fast growing but short lived , evergreen tree or a large shrub upto 10 m tall, 1.5 m in girth, trunk ringed with stipular scars. Leaves distichous, thin to thick, coriaceous, often rigid and brittle, ovate to narrowly elliptic or lanceolate, 6-19 cm long, 1.5-7 (-10) cm wide, upper surface sparsely to strongly scabrid with pustulate-based hairs, lower surface densely tomentose with silvery, appressed, unicellular hairs and shorter, multicellular, glandular hairs, margins serrate to denticulate, apex acute to acuminate-caudate, base asymmetrical, cordate, rounded, or occasionally truncate, petioles 0.7-1.8 cm long, stipules linear-lanceolate, ca. 5-7 mm long. 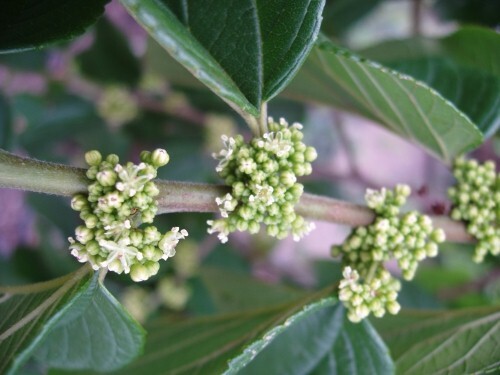 Flowers of different sexes borne on separate branches in a branched panicle or thyrse, bracts ovate, 2-3 mm long; sepals 5; staminate flowers 20-100, in inflorescences up to 2.5-5 cm long, sepals ca. 1.5-2 mm long, pistillode present; pistillate flowers 5-15, in inflorescences 1-2.5 cm long, sepals ca. 1-1.5 mm long, staminodes absent. Fruit a drupe, black at maturity, 3-5 mm long, edible. The fruits are sweet and are eaten by local people. The wood is used in India for tea chests, match boxes, wooden shoes and fishing boats. It is also used for making yokes and rafters when after smoking and seasoning properly. The wood makes a good gunpowder charcoal. The bark is rich in tannin containing 16 per cent of it. So in India, the fishermen use it for roughening and dyeing of their fishing lines. Leaves are lopped for fodder. 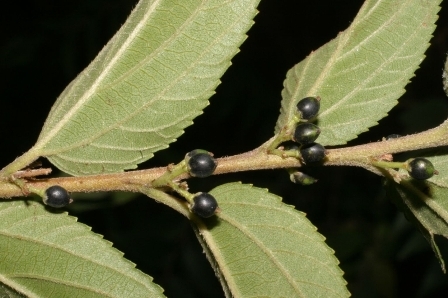 In South Africa, the tender young leaves are used as a vegetable. The root, bark and leaves are used a cure in epilepsy. The bark iscalso reported to be used in the preparation of a poultice for muscular pains. The jio tree is often planted in coffee plantations as a shade tree. As jio leaves make a good fodder for cattle, so in India, villagers also plant this tree around homes for getting the leaves. Jio is best propagated by stumps. Seeds also germinates readily.